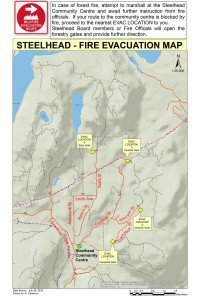 This emergency evacuation plan for the Steelhead area is based on the discussions that Forestry and Fire and Rescue Services staff had with the Steelhead Community Association (SCA) at a meeting on Monday July 6, 2015. 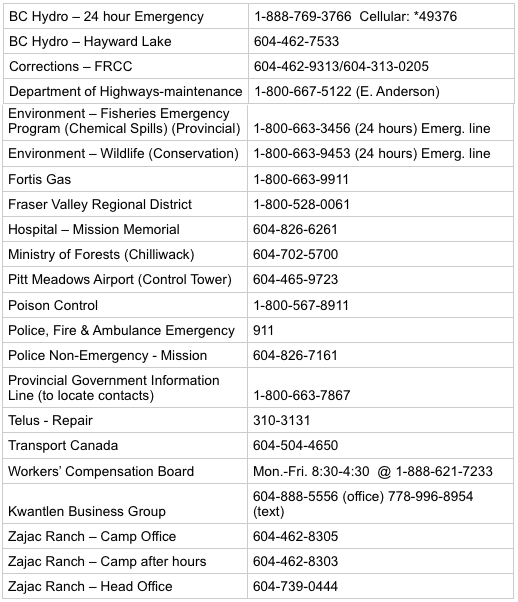 Due to the extreme fire hazard conditions this summer, the rural location within Tree Farm License No. 26 (Tree Farm), and the one road in access for Steelhead residents, we have put together an emergency evacuation plan for this area. This plan includes evacuation collection points and an emergency contact list. In case of an emergency, the SCA community hall would be the temporary emergency centre and marshalling point. Cardinal road south leading to Dewdney Trunk north and south are the main evacuation routes leaving Steelhead. 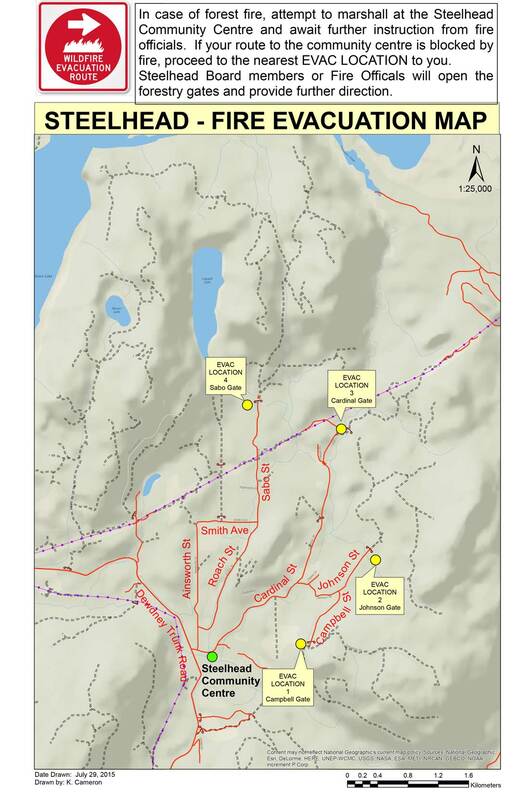 If access is blocked along these main routes, four evacuation collection points have been identified at the start of the logging roads in the Tree Farm. Depending on your location and the location of the blockage, residents are advised to travel to one of the four evacuation collection points. The four evacuation points include the following logging roads: Location 1 – Campbell Road, Location 2 – Johnson Road, Location 3 – Cardinal Road, and Location 4 – Sabo Road (Hunter road area). These logging roads are controlled by gates and the same lock series has been installed on each gate. Eight keys will be issued to the SCA for distribution to the board members at various locations within Steelhead. Please note that these keys are for emergency use only and they must be returned in the fall. Evacuation signs will be installed at various locations in Steelhead that lead to the specific evacuation collection points. In case of an emergency and evacuation, emergency personnel will make arrangements to collect evacuees at these collection points. Location maps will also be placed on the community boards and at the logging road access locations. Steelhead residents are encouraged to register their contact information with the SCA. Fire prevention handout information is also available from the SCA. Click here to download a full-size pdf version of the Fire Evacuation Route Map. View a larger jpg version of the map by clicking the image in the top right corner of this page.